Growing impatiens flowers in containers allows you to enjoy a profusion of bright blooms just about anywhere. Brighten up a kitchen windowsill, sunroom or patio with these constant-blooming flowers. Impatiens flowers are typically flat, with 5 petals and a prominent eye. You'll find them in a wide range of colors: pink, red, salmon, lavender, white and bicolors. Some varieties have double flowers that look like mini roses. Soft, oval leaves are held on succulent stems. Impatiens are sometimes called Busy Lizzy, Patient Lucy and Touch-Me-Not. Among the most popular flowers for shade, you'll find impatiens for sale in garden centers in spring and summer. Many varieties are available. Look for the Elfin and Dwarf varieties -- they're compact, making them attractive house plants. Few flowers? Impatiens won't bloom if they don't get enough light. When growing impatiens indoors, it can be challenging to find a spot where they'll get at least 4 hours of bright, indirect sun each day. If you don't have space near a sunny window, you can move your plant outdoors. Just keep it shaded from hot, direct sun in summer. Water regularly. Keep the soil evenly moist, but not soggy. Flowering plants are thirsty, and they dry out quickly in containers, so check them often. Check out the stylish self-watering pots available now. They not only cut back on your watering chores, these time-saving pots will prevent your impatiens from wilting. Deadhead spent blooms. Remove flowers as soon as they fade to keep plants looking their best and to encourage more blooms. 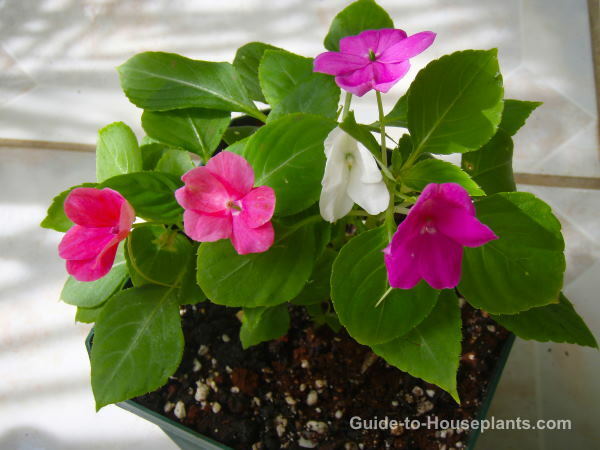 Growing impatiens outdoors for the summer? Before you bring them inside, check the plants for spider mites. They may invade this plant if the humidity is low. Repot plants. You'll get the most blooms by keeping your impatiens slightly pot-bound, so move up to a bigger pot only when the roots fill the pot. Use a pot with drainage holes to prevent soggy soil, which can cause root rot. Light: Bright light; no direct sun in summer. Water: Keep soil evenly moist, not soggy. 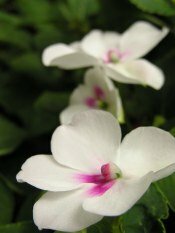 Impatiens flowers will quickly wilt if they are allowed to dry out. Humidity: Moderate (at least 40% relative humidity). Place pot on a tray of wet pebbles to raise the humidity around it. Fertilizer: Feed monthly in spring and summer with a high-potassium liquid fertilizer diluted by half. Too much fertilizer promotes leafy growth and few flowers. Propagation: Take 4 inch (10 cm) stem tip cuttings in spring or summer. 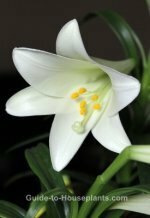 They'll root easily in water or moist soil. Sow seeds in spring or early summer.